If you have a gluten allergy and want to do a 10-Day Transformation that is no problem! There is a new 10 Day Gluten Free Transformation with the Vanilla Chai L.O.V. Super Meal that is available and you can read about it by clicking here. This Gluten Free Cleanse was designed for those with Celiac’s Disease or severe gluten sensitivities. Purium’s L.O.V.E. Super Meal was recently endorsed by the Diabetes Resource Center! 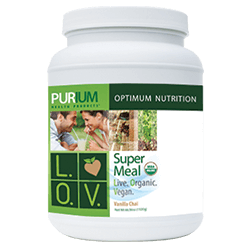 Purium’s L.O.V.E. Super Meal™ and Vanilla Chai L.O.V. are composed of 36 pure, premium, natural, whole food ingredients. They contain 12 green foods, 10 vegetables, 9 sprouts, and 5 mushrooms – and only 2 grams of naturally occurring sugar. They also have 20 grams of vegan protein from organic fermented rice, 9 grams of fiber, and more antioxidants than 10 servings of fruits and veggies!